It only seem a few weeks since I was posting our summer bucket list. We managed to knock a few things off this summer but with The Teens on holiday and Us having no concept of school holidays yet, we didn't get everything achieved since it was rather over ambitious! I'm actually quite pleased that the summer is coming to and end now, around here there are signs of Autumn on the way, the combines are in the fields, the nights are drawing in and the mornings are certainly darker and chillier! 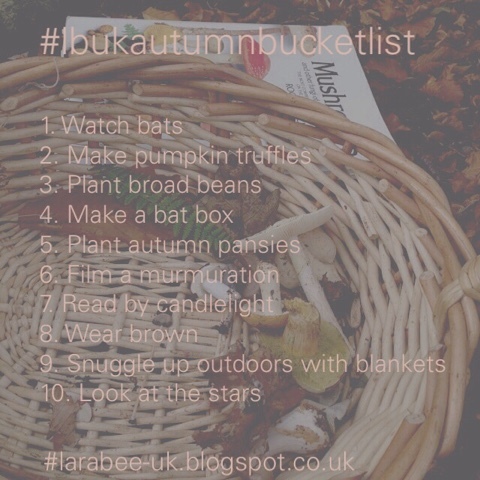 So here's our autumn bucket list. You can follow how we do by checking out #lbukautumnbucketlist on social media. If you're putting your own list together you may find our autumn bucket list inspiration Pinterest board useful, you can see that here. We've also got a Halloween specific bucket list which I'll be posting in October so keep a look out for that.